Who are we looking for, who are we looking for? It's Equiano we're looking for. Has he gone to the stream? Let him come back. Has he gone to the farm? Let him return. This African chant mourns the loss of Olaudah Equiano, an 11-year-old boy and son of an African tribal leader who was kidnapped in 1755 from his home in what is now Nigeria. He was one of the 10 to 12 million Africans who were sold into slavery from the 15th through the 19th Centuries..
"I believe there are few events in my life that have not happened to many," wrote Equiano in his Autobiography. The "many" he refers to are the Africans taken as free people and then forced into slavery in South America, the Caribbean and North America. Along the west coast of Africa, from the Cameroons in the south to Senegal in the north, Europeans built some sixty forts that served as trading posts. European sailors seeking riches brought rum, cloth, guns, and other goods to these posts and traded them for human beings. This human cargo was transported across the Atlantic Ocean and sold to New World slave owners, who bought slaves to work their crops. European traders such as Nicolas Owen waited at these forts for slaves; African traders transported slaves from the interior of Africa. Equiano and others found themselves sold and traded more than once, often in slave markets. African merchants, the poor, royalty -- anyone -- could be abducted in the raids and wars that were undertaken by Africans to secure slaves that they could trade. The slave trade devastated African life. Culture and traditions were torn asunder, as families, especially young men, were abducted. Guns were introduced and slave raids and even wars increased. After kidnapping potential slaves, merchants forced them to walk in slave caravans to the European coastal forts, sometimes as far as 1,000 miles. Shackled and underfed, only half the people survived these death marches. Those too sick or weary to keep up were often killed or left to die. Those who reached the coastal forts were put into underground dungeons where they would stay -- sometimes for as long as a year -- until they were boarded on ships. Just as horrifying as these death marches was the Middle Passage, as it was called -- the transport of slaves across the Atlantic. 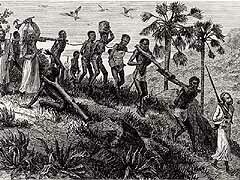 On the first leg of their trip, slave traders delivered goods from European ports to West African ones. On the "middle" leg, ship captains such as John Newton (who later became a foe of slavery), loaded their then-empty holds with slaves and transported them to the Americas and the Caribbean. A typical Atlantic crossing took 60-90 days but some lasted up to four months Upon arrival, captains sold the slaves and purchased raw materials to be brought back to Europe on the last leg of the trip. Roughly 54,000 voyages were made by Europeans to buy and sell slaves. Slaves packed like cargo between decks often had to lie in each other's feces, urine, and blood. 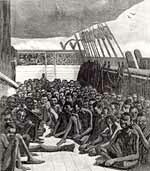 Africans were often treated like cattle during the crossing. On the slave ships, people were stuffed between decks in spaces too low for standing. The heat was often unbearable, and the air nearly unbreathable. Women were often used sexually. Men were often chained in pairs, shackled wrist to wrist or ankle to ankle. People were crowded together, usually forced to lie on their backs with their heads between the legs of others. This meant they often had to lie in each other's feces, urine, and, in the case of dysentery, even blood. In such cramped quarters, diseases such as smallpox and yellow fever spread like wildfire. The diseased were sometimes thrown overboard to prevent wholesale epidemics. Because a small crew had to control so many, cruel measures such as iron muzzles and whippings were used to control slaves. Over the centuries, between one and two million persons died in the crossing. This meant that the living were often chained to the dead until ship surgeons such as Alexander Falconbridge had the corpses thrown overboard. While ships were still close to shore, insurrections of desperate slaves sometimes broke out. Many went mad in these barbaric conditions; others chose to jump to their watery deaths rather than endure. Equiano wrote of his passage: "Often did I think many of the inhabitants of the deep much happier than myself."